Two Raven's Tot yongsters were shown today in different parts of Finland. 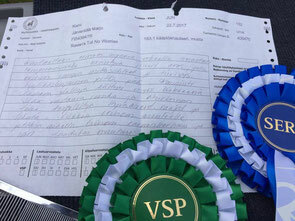 Black& silver Raven's Tot Out Of The Blue (Gaston de Aduana x Raven's Tot Just Dance) took part in Lahti Puppy Show, judge Teija Salmi-Aalto, and was BOB-puppy with wonderful critique. Congratulations! Black - Raven's Tot No Worries (Amstel And Don Monolith x Raven's Tot Listen To Your Heart) two days ago moved to the junior class and was shown in International Dog Show in Kemi, judge Marjo Järventölä. He got perfect description and was BOS with CAC. Last phrase in his description - quality schnauzer. <3 Perfect start for this young boy! Congratulations Mervi!